John had cleaned up 8 rail chairs on Saturday, so I spent a couple of hours applying the first coat of anti-rust (Deproma) to their tops, today. An email arrived on Friday ordering a GWR boot scraper; another email yesterday - so that's orders for eight (6 x GWR + 2 x GNR) in the space of a few days! Plus Alan wanting to collect two at our AGM. By the time I arrived, Bruce (aided by Loco Dept chaps) had fixed the outstanding things in preparation for 2807 to steam over the weekend. In particular, he (they) re-fitted the brass bonnet over the safety valves. 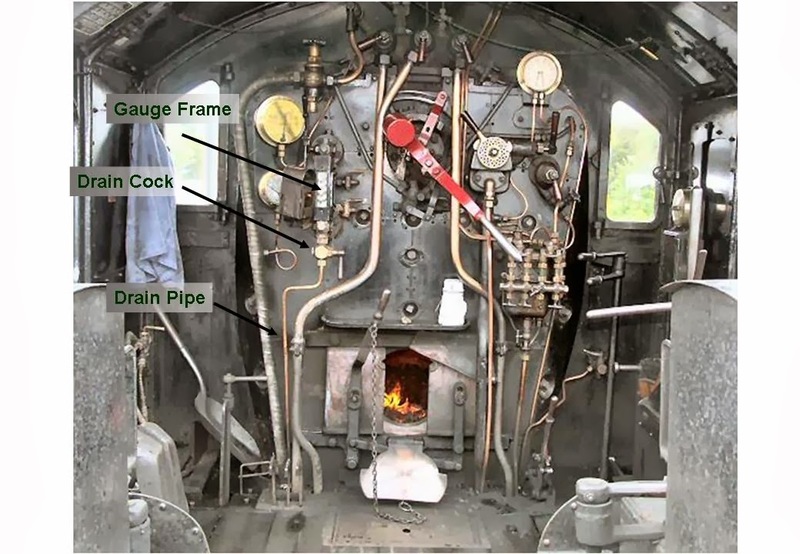 Bruce then spent much time removing and lapping in the "pep" pipe on/off valve, which had been seen to dribble during the steam test - more of which, below! I (of course) pressed on to meet the 8 extant orders for boot scrapers! This included an hour or more on the following days, too, applying paint and lettering in order to also have enough stock to re-supply the F&W for the final week of normal running. This was our AGM. Nothing exciting happened. We did go for a ride behind 2807 from Toddington up to Laverton, back to Cheltenham, and return to Toddington. A group of 7 of us managed to sit together (the train was amazingly full). Nattering, as we were, a chap in the seats behind us suddenly stood up, saying, "I couldn't help overhearing you taking about 2807. I am one of the chaps who rescued her from Barry in 1981." 2807 was on luncheon train duty, and I was lucky enough to catch her at Winchcombe, and took a photo of the "pep" pipe system (see attached). The "pep" pipe was still dribbling! The on/off handle is a two-way tap. In the "off" position it points outwards (as in the photo). 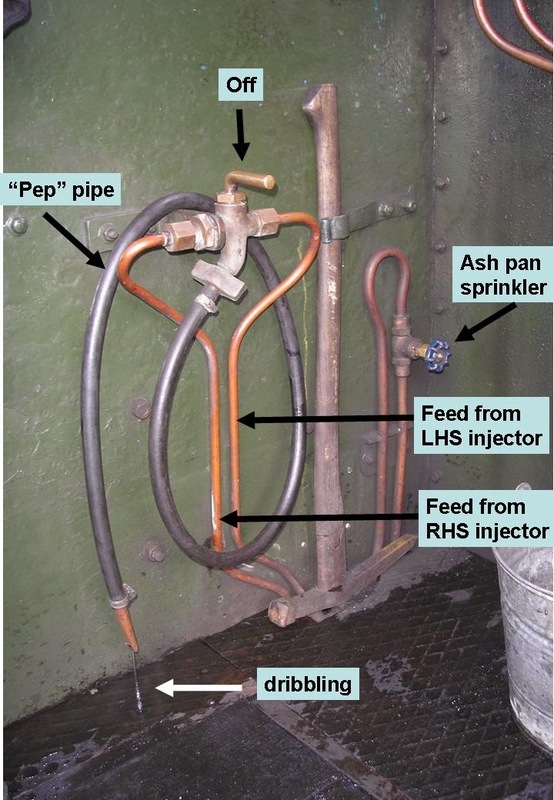 The pep pipe (aka "slacking" pipe - possibly because it is used to wet down the coal slack to stop it blowing into the cab when travelling backwards **) operates when the injectors are used. The two feeds are one from each injector. 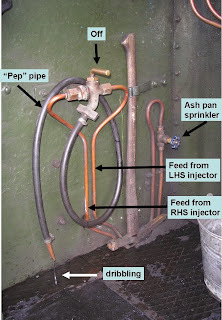 When the injector is on, the pep pipe can be used - to clean coal, clean the cab, etc. However, it is clearly dribbling still when the injectors are not being used. This means that there is pressure (potentially up to 200 psi) in at least one of the feed pipes. This occurs because the top clack valve (that feeds water into the boiler) leaks, and back pressure builds up in the pipe. The "wheel" valve turns on the sprinkler in the ash pan, intended to damp down ash and also cool down cinders and prevent fires burning in the ash pan. It is most useful when cleaning out the ash, which flies everywhere! But it is easier to stuff a hose up the ash pan and wet it that way! Having talked it through with Andy Webber (the fireman) on Sunday, he decided to crack the wheel open and let the pressure damp the ash continually, rather than have a copper pipe with 200 psi in it next to his left leg! I'd be interested to know how that went. ** In the old days, of course, it was used by firemen to spray train spotters who were sitting along the line-side. However, H&S won't allow that these days. Finished off the 8 ordered boot scrapers. Couldn't see 2807 - wanted to take a photo of the springs & compensating beam. She must have been hiding somewhere (else blown along the line). It was a tad damp this morning. Bruce had started painting rail chairs by the time I arrived. Together, we painted and lettered quite a few. By lunchtime, there were about six ready for restocking. On the way to Todders, I called in at Winchcombe and they had sold 2 boot scrapers. When I got home, there was a message saying they'd sold two more! Carpo had been too busy to set a warming fire on Tuesday, so was unable to do a steam test today. However, WSR-Mike volunteered to do one under my supervision (thus saving me the hard work .. mostly). Carpo agreed. I took Mike through the routine, with Bruce tagging along as a refresher. The newly fitted (LH lower) mudhole door was weeping slightly, and will no doubt "hiss" tomorrow, but it should then bed itself in. Bruce checked the nuts on the tender brake hangers. We are under instruction that these be checked weekly in case they come loose. GWSR has requested that the bolts be made longer and split pins fitted to prevent the nuts dropping off. I had to go to Gloucester Royal Hospital, so could not assist Carpo. Luckily, no one else went to assist Carpo, because he got way-laid, and didn't do the steam test! He agreed that I should do another warming fire on Friday, and he would do the steam test (i.e. set the safety valves) on Saturday. Still 10 psi on the clock when I arrived at 10.30, and the Loco Dept were stoking up the fire ready to spread it over the whole grate. John had already started on needle-gunning and wire-brushing rail chairs. During the week, I had a phone call ordering 4 GWR in brown, to which the gentleman added two GNR, making a total order of six! Bruce went round the tender checking that the nuts and bolts holding the brake hangers were all tight. The only one that he has detected as being loose at all was the rear LHS which we had removed to rectify the pivot pin. There is no sign of any others working loose. Bruce also assisted with the steam testing. Gil was cutting up sheets of metal ready to fabricate a new lower half for the rear section of the ash pan. I was painting rail chairs (but you might have guessed that). Meanwhile, Carpo kept popping up the ladder and tightening the safety valves each time she blew off. I had been a tad concerned about leaving the loco with a warming fire over night, because the springs had not been tensioned at all. We had no idea at what pressure they would blow off. It turn out that they blew at about 30 psi, If they had blown at, say, 10 psi, the boiler could have lost a lot of water over night. Photos attached show the pressure gauge reading 220 psi and the safety valves just "feathering" (it's not a cloud!) as Carpo completed the testing. Bruce spotted a couple of minor steam leaks - the "pep" pipe (aka slacking pipe) was dribbling, indicating that the tap was leaking (and also that there was pressure in the steam feed to the injectors, which in turn implies a leak in one of the clack valves). However, Neil Carr said clacks often leak; and Carpo was happy enough. One of the injector covers also has a slight steam leak. A union on top of the "steam fountain" in the cab also had a whisp of steam. Jobs for Wednesday! So, it all looks "go" for 2807 in service on Saturday for our AGM. I was only able to do a limited amount of painting, due to my current state of health. However, Bruce was full of energy, and said he'd try to complete the painting during the day. Carpo has not be thrilled with the fit of two of our mud hole doors, and asked for the boiler to be drained to enable him to address the seats. To do so, we use the blow-down valve. GWSR no longer carry out blow-downs (because the Reverse-Osmosis plant clears salts out of the water delivered to the tenders). The valve should be turned to exhaust downwards (into a pit). While based at Winchcombe during the slippage era, there was no pit! So we adjusted the valve to blow-down out sideways. 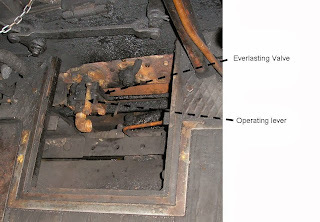 When an attempt was made to disconnect the pipe fittings which form the blow down pipe, the thread on the elbow adjacent to the blow down valve failed. Examination of the fitting showed that it was a fabricated elbow which had been put in because of the restricted space available to accommodate the “Everlasting” Blow down valve specified to us by GWSR. The cause of the failure was a combination of corrosion and erosion of the steel pipe work used. GWSR has advised us to replace the current "Everlasting" valve (which they encouraged us to get in the first place) with a standard GWR style (which we originally had, but subsequently sold!). I nipped in for an hour and painted 4 of the chairs. I nipped down to paint the other chairs, only to find Bruce there already painting them! Because he'd not had time on Weds, after all the trouble with the pipes, he kindly thought to pop in and move the chairs along the conveyor belt for me! John attacked a pile of rail chairs with the needle-gun and wire brush. Bruce replaced the steam safety valves in readiness for Carpo to adjust them. However, Carpo has to re-seat the mud hole doors before we can do any steam testing of the valves. 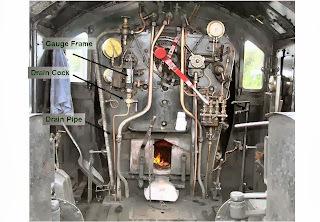 We had some discussion about the blow-down valve, notably how to prevent the spanner (used to open & close the valve) from dropping beneath the loco into a cloud of 300 degree steam - it's a shade too warm to pop under and pick the spanner up again! To help you understand the valves (a little) two pics are attached - one of a GWR pattern, sideways on; you can see the nut and the retaining bracket. The other is ours under the cab floor (hence less clear). Operating it is a doddle - you just move the lever (with your foot). Steve wanted to help Bruce, but that proved difficult, so he tackled some rail chairs, firstly cutting off bolts and then helping John prepare them. Some bottoms then got painted!